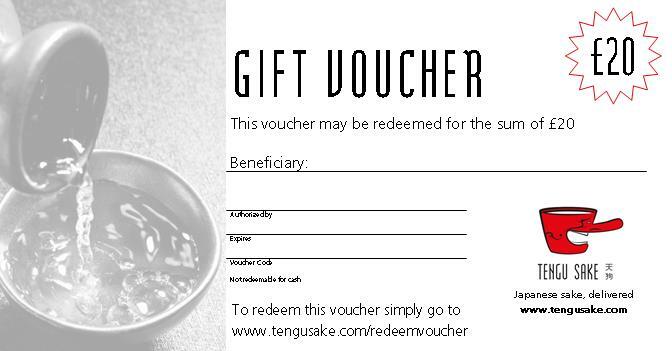 A Tengu Sake Gift Voucher is the perfect present for the sake enthusiast or Japan-o-phile. Any gift voucher can be used in our shop and all vouchers are redeemable against purchases of sake or sake wares. Can you think of someone who loves sake? A Tengu Sake Gift Voucher is the present for them! When you purchase a gift voucher we will either email or post (your choice) the voucher to any UK address. Each voucher comes with it’s own unique code and instructions on how to redeem the voucher for Reward Points on our site. When redeemed, a voucher credits the user’s account with the number of Reward Points equivalent to the value of the voucher. For example, if you buy a £50 voucher, the recipient can exchange the voucher for £50 worth of points. Send us your details by filling in this form and we’ll get back to you. Please tell us any other information you feel is relevant.